I came to The Allotment just a week after finishing university and was unsure what to expect. The transition from education to the real world can be extremely daunting and something that cannot be taught. However during my time at The Allotment I felt very welcome and included; it was a great introduction to the industry. I gained hands-on experience, working on real-life projects and tasks that required me to develop all aspects of my skills. This ranged from from copywriting and idea generation to designing documents. I believe this responsibility has been invaluable, has allowed me to grow as a designer and understand more about preparing myself further for the graphic design industry. These experiences are something that I believe I wouldn’t have been able to gain at a larger agency. "During my time at The Allotment I felt very welcome and included; it was a great introduction to the industry." 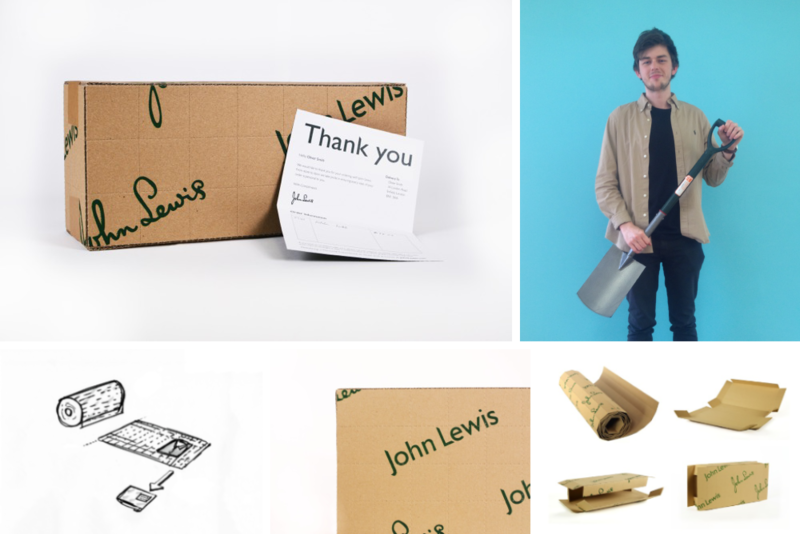 To reinvent the John Lewis delivery packaging, I created a universal system whereby each product can be packaged in a cardboard box sized uniquely for that product. The card is recycled and corrugated for extra support and taped together using perforated tape. This design is both efficient and eco-friendly. This project is a 2015 D&AD New Blood Wooden Pencil winner.